Ever since they were young, my girls have enjoyed playing dress-up. Sure, they like wearing costumes at Halloween, but they also dive into our dress-up bin during the year. One day, they pretend they're firefighters, and the next day, they're princesses. While they have fun transforming into different characters, they also gain five important benefits as they play. When kids dress up, they can be anyone and live anywhere as they create characters, scenarios, and storylines. Their play time allows them to explore other realities and take on unique roles. And it doesn't matter if their stories make sense because they're being creative. Encourage your kids to imagine when you provide them with costumes and props. You can even give them story ideas or let them create their own scenarios as you foster their imaginations. It's important to me that my girls understand other people. I want them to be sympathetic and kind as well as supportive of other lifestyles and cultures. This empathy helps them to be successful in school, friendships, and life, and they learn this lesson while playing dress-up. In costumes, kids can be people or animals from different countries. They also explore a variety of social situations and emotions that help them empathize with others and practice patience, tolerance, and kindness. I'm grateful that with a few costumes, my girls can become more compassionate people. As doctors, Martians, or dancers, kids have to think about what their character will say and effectively communicate the character's mindset, values, and wants. I've even heard my girls deliver their dialogues in an accent and say phrases and words they don't normally use. Communication happens when kids play dress-up solo, too, since they typically act out stories with their stuffed animals or imaginary friends. Thanks to dress-up play, our kids develop better communication skills and are more prepared for success in everyday life. My girls take dress-up very seriously. They outline detailed stories and scenes that really stretch their creative thinking skills. In fact, last weekend, they imagined that they were doctors and created an entire hospital in our playroom. It's fun for me to watch them problem-solve, negotiate, and become confident expressing themselves. The creative thinking skills they learn now will assist them in life as they think outside of the box to solve problems and find solutions quickly. Kids who pretend they are someone else actually learn more about themselves and their identity. They can figure out their emotions, values, and self-worth as they play. For example, while playing a teacher, they may learn that they like helping others learn, and while playing a villain, they may see how selfishness hurts others. Dress-up also helps kids become confident in who they are. It allows them to take charge, make mistakes, and develop a unique style. I appreciate that dress-up encourages self-discovery and helps my girls develop a stronger sense of self-esteem and self-identity. 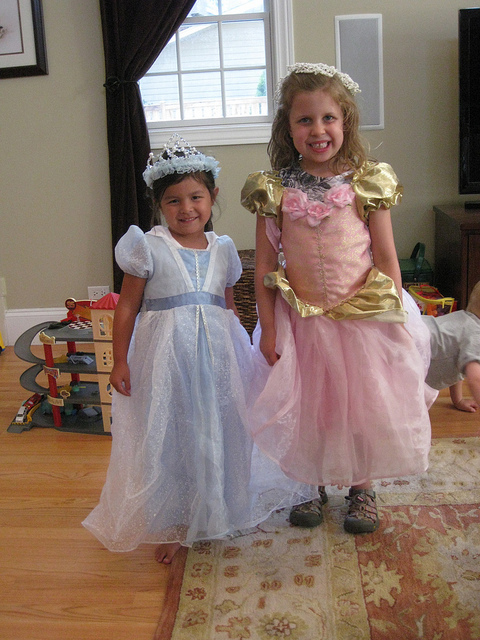 Playing dress-up is a fun activity that gives kids five key benefits. I know I love hearing my girls giggle, talk, and cooperate with each other as they wear costumes. What other things could dress-up play help your kids learn this Halloween and every day?